The advancement and integration of renewable energy resources is critical to our energy future. Currently, the United States is heavily reliant on fossil-fuel based power generation, which emits high levels of greenhouse gases such as carbon dioxide (CO2). Marine hydrokinetic technology (MHK), used to capture energy from waves, tides, and ocean currents, is a clean, renewable power source that could help reduce harmful greenhouse gas emissions if widely adopted. However, widespread deployment of MHK systems will require significant reduction of their levelized cost of energy (LCOE). Studies show that operations and maintenance costs associated with MHK devices account for over half the lifecycle costs of any given MHK project. Many factors also limit when maintenance can be performed, such as accessibility challenges and suitable weather conditions at sea. Overcoming these cost and maintenance barriers could encourage greater adoption of clean, renewable MHK systems. The Ocean Renewable Power Company (ORPC) will develop an innovative, self-deploying MHK power system, which will reduce the operating costs and improve the efficiency of MHK systems by up to 50%. ORPC's system is based on pitch control of the blades of a cross-flow turbine, in which the tidal flow passes across the turbine blades rather than in a radial fashion. This system will allow the turbine to self-propel itself to the deployment location, and lower itself to the sea floor remotely. 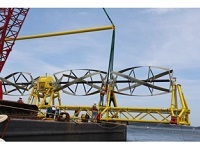 This innovative approach will allow for lower costs of deployment and retrieval, reduced requirements for sea-bed foundation construction, as well as increased turbine efficiency. The ORPC team will design, build, and test a model scale of the MHK system to demonstrate the benefits of using a self-deploying turbine, before completing the design and cost analysis of the full-scale commercial system. Successful deployment of this system would significantly reduce the LCOE associated with MHK systems, making the technology a viable renewable resource to generate electrical power. If successful, the ORPC's innovations could reduce operations and maintenance costs for a typical MHK project by a factor of 2 and increase its energy efficiency by up to 50%. Increased utilization of renewable energy resources could improve grid resiliency by having more power generation options available. Greater use of MHK systems could lessen use of fossil-fuel based power and reduce CO2 emissions. This project will foster a U.S.-led industry in marine hydrokinetics by overcoming maintenance and operations costs that contribute to the current high LCOE associated with MHK systems.